Collection, handling damage... Commonly burn from shipping, inappropriate acclimation. I have a 240 gallon FOWLR with the French angel, 2 clowns, hippo and lemon peel. Nothing new has been introduced in 3+ years, but now my angel is in bad shape. My LFS said it looks to be a tumor and that nothing can be done. His mouth looked irritated at first and now seems to be disappearing...almost like something is eating it away. i can send you a pic. I tried a bacterial medication, but it did not work. He hasn't eaten in 4 weeks, but does still swim a bit and hover in the corner of the tank. Do you think this is hopeless, or is there something else i can try? Thanks for the reply. I've attached a picture of his mouth as you can see the skin is pulling away from his mouth. If it is hopeless, should i consider euthanizing him? After 16 years, I'd hate to see him suffer. I very recently purchased a regal angelfish from a local supplier and while has been in my QT tank for around 2 days now and just this morning i noticed a lesion/sore on its mouth and a little missing tissue on both gills. The mouth sore seems to be swollen with some tissue missing as well. There is nothing in that QT except a few pipes to hide in and a sponge filter along with some air stones. The angelfish, since i recently acquired, it isn't eating yet and I of course don't want to lose him. This sore is the reason I am sure that he is not eating. I started treating with quinine sulfate on day 1 when i got him for preventive maintenance against Ich which is what I always do before i add any fish into my FOWLR. Aside from that, I have not added anything else into the tank. I am not sure what else could have caused this. I was reading on WWM and it seems most consistent with some sort of bacterial infection. Is this assessment correct and if so, how do I get him better? Thank you and any advice would be greatly appreciated. Yeah, I did also think it was from shipping. The strange thing was that the first day he was there, he was totally fine. All the damage came out on day 2. Is that still possibly from shipping? 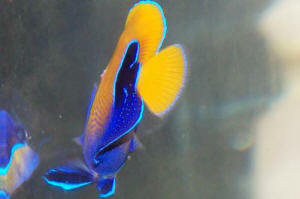 I contacted the supplier and they said they put copper on all their tanks even on the angelfish. Could that possibly also be the cause? Our angel has stopped eating. Could it be something else? It's been a couple of weeks now and the angels eye swelling went down but is still red. I noticed he is starting to get a couple of red spots of the side of his body. He is also breathing a little heavier than usual. Could he have a parasite of a bacterial infection. ? Please help. I really trying to get him better. I have been feeding food with garlic and keeping the water quality good but he doesn't seem to be getting better. All the other fish seem fine. What do you meaning ...sampling scooping ? My angel really isn't doing well. He is pretty much at the bottom of the tank leaning against a rock just breathing. It seems like there is something else going on cause his fins look like they are shedding. I included another picture . At this point is there something I can do to save him? If I put him in a qt tank will I just make it worst ? I live in Canada and I don't have access to many meds like the one bob had suggested. Ok so I closed the lights and he started swimming around a little. Should I prep a qt tank just incase ? I have a 10 gallon that I use for my smaller fish but my angel is pretty big. What size should I buy as a good qt if the answer is yes ? 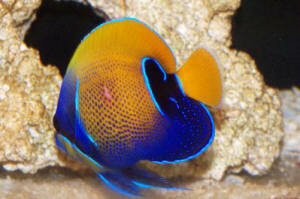 Angel fish on the mend >Hi again, >>Hello the first time from me, Marina here this morning, Lynn. >Really hate to bother you guys again, but your the only ones that I can count on. I wrote to you a few weeks ago and told you about my French angel. ( I'll just refresh your mind about it. I bought a 3" juv French and kept it in a 40 gallon quarantine tank. Water parameters where kept perfect...literally. PH 8.3, temp 82, A=0, Ni=0 Nitrate 0 On the 23rd day of quarantine he quit eating, but not chasing the food, looked a bit off and had some what I would almost call a fading or spots around the face and front of him. (not crypto, but possibly velvet) I immediately started copper with him and did this for 6 days ( 20 ppm) He didn't seem to pick up a whole lot but didn't get worse either. I also lowered the salinity to 1.015 and added Maracyn 2. On the sixth day I decided that I must have diagnosed his disease incorrectly as I believe I should have seen more of an improvement within that time. >>Wow, smart! I'm impressed with your whole method, very good. >I then did a 35% water change and added carbon etc. The next day I added quick cure (1 drop per gallon) within 48 hours he was eating again and looking definitely livelier. I was greatly relieved. This was on April 4th that I started the quick cure treatment for 7 days. (removing the filters) but keeping the water pristine. I then quit with it and added malachite green for a few days. The angel is acting normal and eating but I can still see " marks" on him...around his face and front end? ?